Star Wars Force Link Resistance Ski Speeder Captain Poe Dameron New! Star Wars Rogue One 2pk Snowtrooper Officer & Poe Dameron Hasbro 3 & 3/4"
New Star Wars The Force Awakens 3.75-Inch Figure Lot Of 8. Star Wars Poe Dameron Force Link 3.75" Ation Figure. Condition is New. Shipped with USPS Priority Mail. Item previously owned by adult collector and used in display only. Only pulled out to ensure all pieces and parts where there. Expand and enhance Star Wars collections. Play with the 4 included accessories. The card & blister are in excellent condition almost mint,nothings mint. You're already purchasing the item. New In the Box Sealed. Item is in BRAND NEW, unopened condition. Item has no damage to box or figure. Featured is a Star Wars: The Black Series Poe Dameron action figure (3.75 in.). The ace pilot of the modern X-wing fighter, Poe is a leader in the Resistance against the evil First Order. Recommended age is 4 . Made by Disney Hasbro. Starwars The Force Awakens Poe Damerons X-Wing Action Figure. Condition is New. Shipped with USPS Retail Ground. Star Wars X Wing & Poe Dameron Mini Figures Disney. Condition is Used. Create adventures and scenes from the Star Wars Universe. 3.75-inch-scale, Star Wars Force Link-activated Resistance Ski Speeder and Captain Poe Dameron figure Wear Force Link gear (Available in Starter Set. Sold separately) to activate figure sounds and phrases and vehicle sound effects! Resistance Ski Speeder vehicle features a detachable right wing that can be blasted off for an awesome battle effect Resistance Ski Speeder vehicle fires projectiles, creating more Star Wars action Includes: vehicle, figure, accessory, projectile, and instructions. 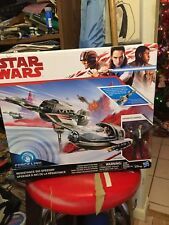 Star Wars Poe's Boosted X-Wing Fighter Toys R Us Only Exclusive Force Link New. Condition is New. Shipped with USPS Priority Mail. 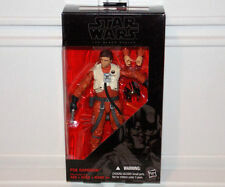 New ListingStar Wars The Last Jedi (TLJ) Force Link Poe Dameron (Resistance Pilot) 3.75"
Figure is brand new sealed in package. Thank for veiwing my sale. Poe Dameron Star Wars Elite Series Die Cast Action Figure Disney Store New NIB. Condition is New. Shipped with USPS Priority Mail. 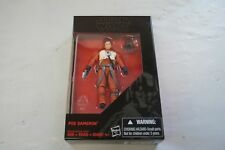 STAR WARS Disney Elite Series Die Cast Figure POE DAMERON Brand New MAKE OFFER! Bring the galaxy to life with Force Link! Recreate the adventures of a galaxy far, far away with Force Link, a new interactive play system from Hasbro that gives kids the sound effects and phrases from the Star Wars movies right in the palms of their hands. 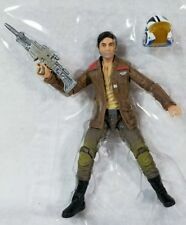 Star Wars Black Series 6 Inch Captain Poe Dameron #53. Condition is New In box. Shipped with USPS First Class Package. Inspired by Star Wars: The Last Jedi. this information has been plainly provided for you. The only thing that is custom is the head.